Lately, it seems like just about everyone wants to take a bite out Chick-fil-A's formidable fried chicken sandwich empire. But now, the southern fast food chain is biting back, this time eyeing Starbucks's turf with a frozen coffee drink, launching nationwide next week: Frosted Coffee. 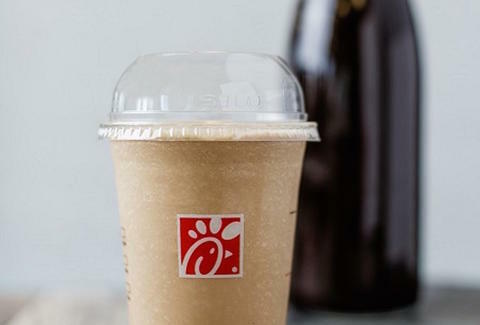 Chick-fil-A describes Frosted Coffee as a creamy mixture of its vanilla Icedream ice cream and cold-brewed iced coffee that comes hand-spun, just like a milkshake. The all-new drink will come in two sizes -- small (14oz) and large (20oz) -- and will start at $2.69 when it lands at Chick-fil-A restaurants nationwide on Monday, March 14th. It'll be available only through May 31st, according to a press release. The offering comes on the heels of the successful Frosted Lemonade drink Chick-fil-A launched last year, and makes perfect sense, considering the company's big splash into the premium coffee business back in 2014. In fact, Thrillist named both its hot coffee and iced coffee the best among fast food chains like McDonald's, Dunkin' Donuts, and Burger King. We haven't gotten our hands on a Frosted Coffee yet, but according to a report by Business Insider, it's actually "much creamier and smoother" than a Starbucks Frappuccino, which the coffee giant's baristas make by blending coffee, milk, and ice. But given how popular and uniquely customizable Frappuccinos are, there's likely plenty of room in your diet for both drinks. Tony Merevick is Cities News Editor at Thrillist and used to be a fan of sweet coffee drinks, but has gradually grown out of that. Send news tips to news@thrillist.com and follow him on Twitter @tonymerevick.